Pomegranates are an ancient fruit with a rich history. With a bright, unique flavour, this is a jelly for grownups. Sure, kids love it too, but if you think jelly is for kids’ lunches this organic pomegranate will change your mind. Try Pomegranate Premium Spread on toast. With butter. Mmm . . . INGREDIENTS: ORGANIC POMEGRANATE JUICE FROM CONCENTRATE (WATER, ORGANIC POMEGRANATE JUICE CONCENTRATE), ORGANIC CANE SUGAR, ORGANIC POMEGRANATE JUICE, APPLE PECTIN, ASCORBIC ACID (VITAMIN C), CITRIC ACID. Made with organic cane sugar from an ethical and environmentally friendly source certified EcoSocial by IBD. I red somewhere that pomegranate is excellent at the breakfast. And delicious! I was looking forward to the tart taste of pomegranate but was very disappointed. 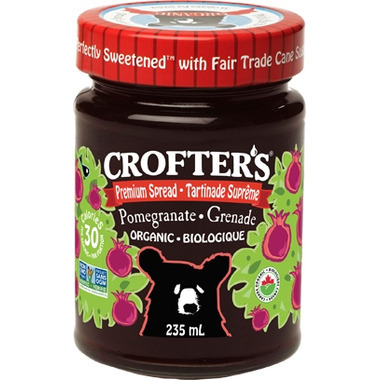 This jam is very thin and runny, very much too sweet and with no detectable flavor of pomegranate. I will definitely not buy it again. Excellent product, but I prefer the unsweetened version. This is absolutely delicious treat. I eat it with pumkin seed butter on bread and I love it. I am loving this on toast, it's so good I think I could eat it by itself and skip the toast! This didn't last very long in my house! It was delicious! We had it with butter on homemade biscuits, My son loved it!